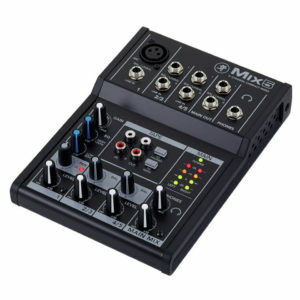 Notepad’s integrated USB audio interface allows you to easily record, edit and play projects using your favorite audio software. By combining Soundcraft legendary audio performance with HARMAN signal processing and the built-in USB interface for your computer, Notepad offers the best of both analog and digital audio in a no-compromise solution. 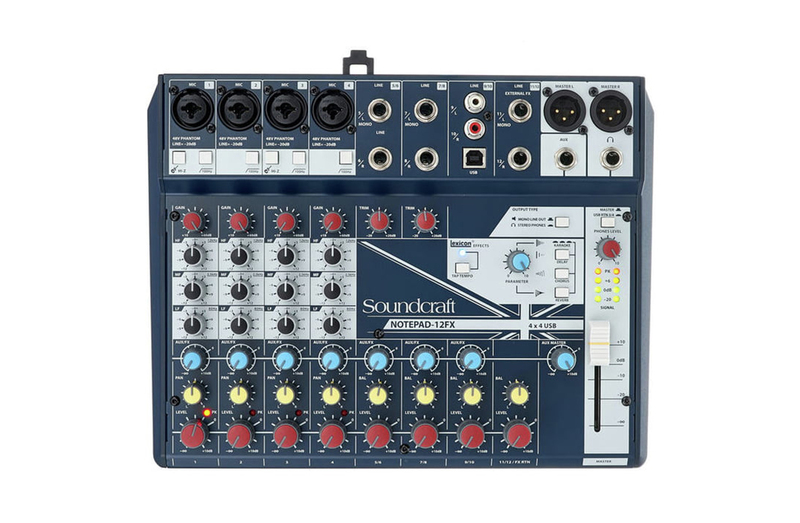 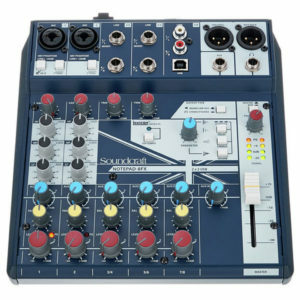 The Sound Live 12 is a compact 12-channel/2-bus tabletop mixer that easily handles all the equipment, switching and signal shaping you need to produce first-rate recordings, without the expense, bulk and inconvenience of an overly-complicated studio console. 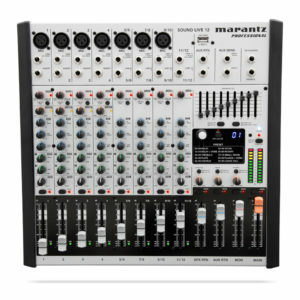 Among the full roster of professional-caliber features are 7 XLR inputs with ultra-clean sounding Marantz Professional mic pre-amps, Dynamic compression (channels 1 to 4) 60mm faders with mute switch, 100 studio-grade digital effects and a 9-band EQ for main and monitor outputs. 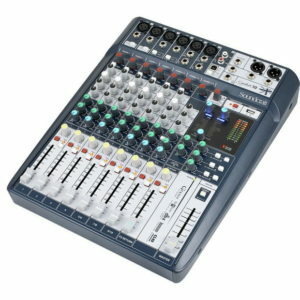 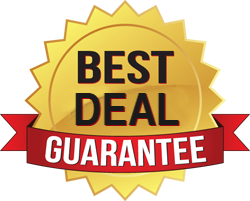 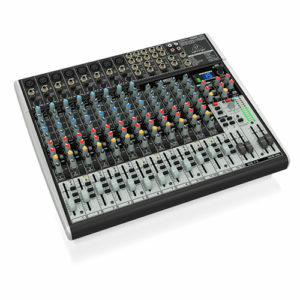 It all adds up to a space-saving desktop mixer with no-compromise audio performance and connection versatility that results in top-quality productions coupled with unsurpassed ease-of-use. 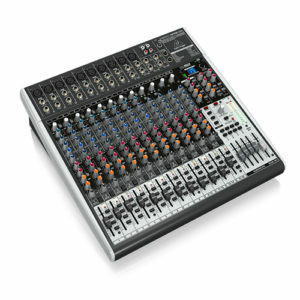 Feature-rich and delivering outstanding sound quality, the Yamaha MG16 analog mixer is well-suited for portable rigs or permanent installations. 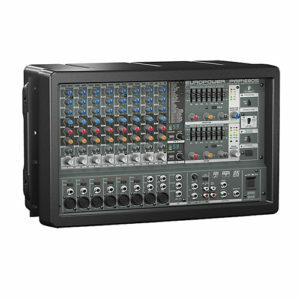 The MG16’s quality op-amp ensures that your mix sounds transparent and articulate. The MG16’s crystal clear D-PRE preamps will squeeze every drop of tone from your mics, with natural-sounding bass and smooth highs. Featuring switchable phantom power, a pad switch, one-knob compressors, EQ, plenty of I/O, and LED metering, the MG16 can take on just about any task you throw at it. 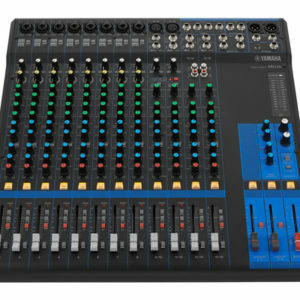 Utilizing many state-of-the-art features from Yamaha’s high-end consoles, the MG16 is ready to work for you! 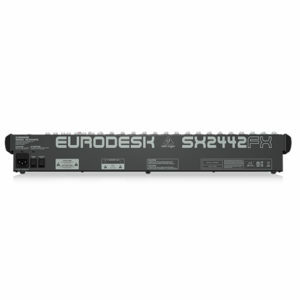 The 24-Input, 4-Bus EURODESK SX2442FX allows you to effortlessly achieve premium-quality sound, thanks to 16 of our studio-grade XENYX Mic Preamps, 2 full stereo channels with 4-band EQ, plus 2 additional sets of stereo inputs channels with Level and Aux controls.All mono channels feature our ultra-musical, 3-band “British” channel EQs, complete with a semi-parametric mid band for the ultimate in sound sculpting. 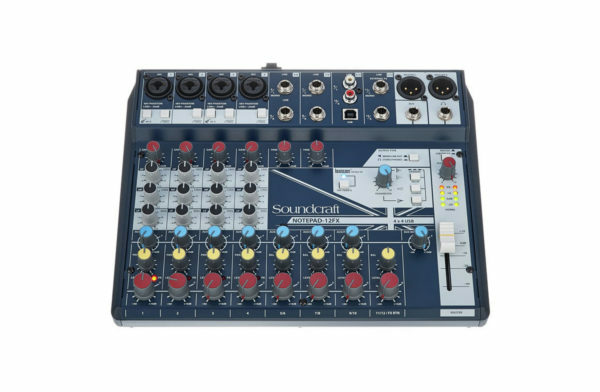 Add to this not one, but two of our 24-bit dual-engine stereo FX processors with 99 awesome presets including reverb, chorus, flanger, delay, pitch shifter and various multi-effects – and the SX2442FX becomes an incredibly versatile mixer for your recording projects and live performances. 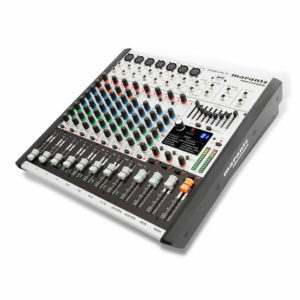 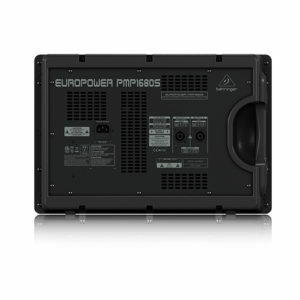 The amazing PMP1680S Powered Mixer packs tremendous power (2 x 800 Watts stereo or 1,600 Watts in Bridged mode), while maintaining an incredible power-to-weight ratio. 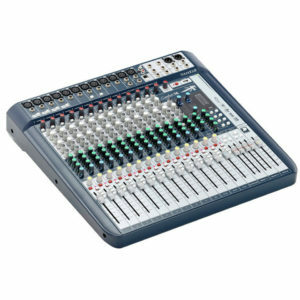 These mixers employ high-efficiency Class-D technology and a state-of-the- art switch-mode power supply, which significantly reduces weight and heat. 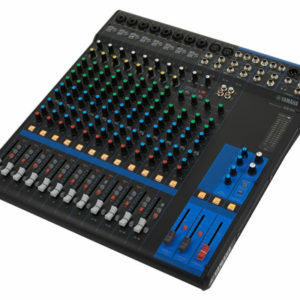 The 10-channel PMP1680S features 8 high-quality mic preamps, 2 stereo channels, dual 24-bit Multi-FX processors with 100 awesome presets including studio-class reverbs, delays, pitch shifter and various multi-effects, plus a 7-band stereo graphic EQ with our proprietary FBQ Feedback Detection System – for the ultimate in feedback-free performance. 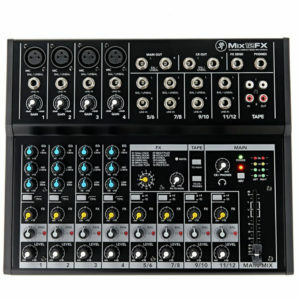 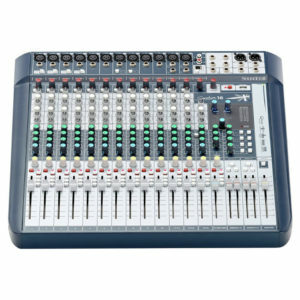 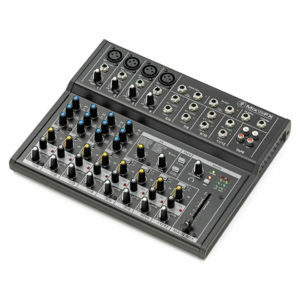 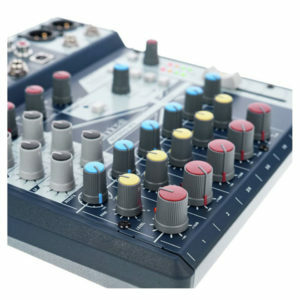 Compact Mackie Mixer Quality with Onboard Effects! 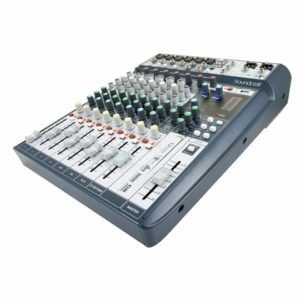 The midsize Mackie Mix12FX desktop audio mixer offers you the full-scale functions and the quality everyone here at Megsstar Technology has come to expect from Mackie. 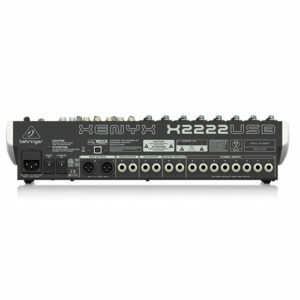 Four microphone preamplifiers with switchable phantom power, 3-band EQs, and 75Hz highpass filters accommodate a wide range of mics and mixing conditions. 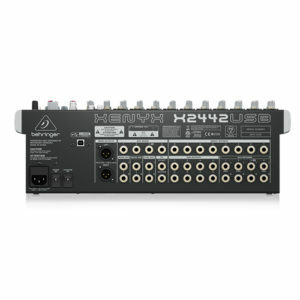 Another four stereo channels let you connect keyboards, media players, and other line-level gear. 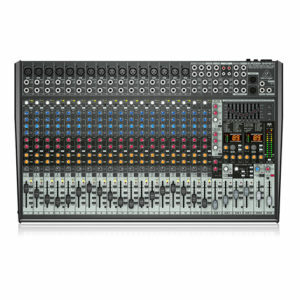 Each channel also comes with an FX send, which lets you tap into Mix12FX’s effects processor. 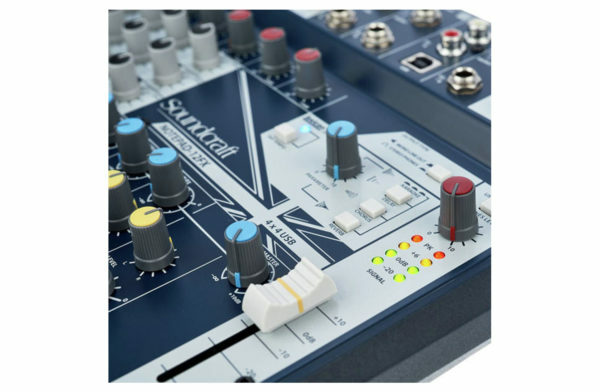 Twelve onboard digital effects make it easy to add reverb to vocals, depth to drums, or atmosphere across your mix. 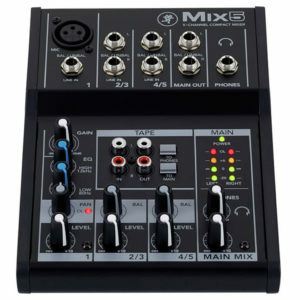 Whether you need a small mixer for your live show or your creative work, the Mackie Mix5 proves that you don’t have to give up decent sound quality, just because you need more channels or extra bells and whistles. 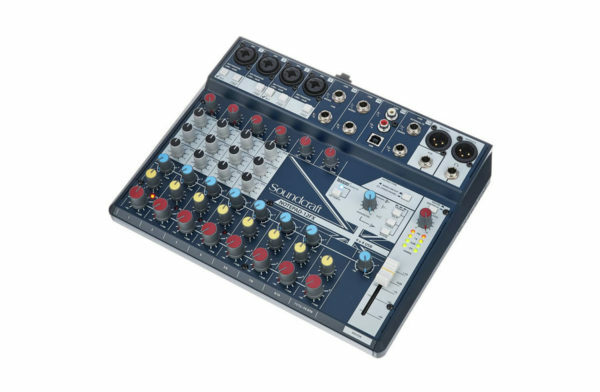 In addition to the quality Megsstar Technology engineers have come to expect from Mackie, this extremely compact 5-channel mixer offers a single microphone preamplifier outfitted with a 2-band equalizer plus two additional channels with stereo inputs for keyboards or music players. 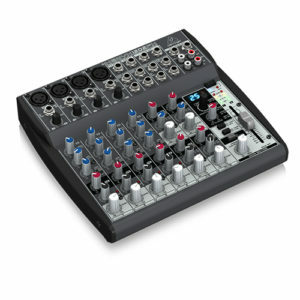 For added convenience, the Mackie Mix5 even comes equipped with an RCA I/O path for recording and separate volume controls for the main and the headphone outputs.